Когда приходишь в музей Ван Гога в 7-й раз, у тебя уже есть план: так, сначала пробежаться по автопортретам первого этажа (не нарисовал ли он чего нового), пробежать мимо второго этажа сезановщины и рембрантщины – парижского периода пуантилизма и темных картин его раннего творчества типа “Поедателей картофеля”, проскакать мимо Киса ван Донгена и бежать, бежать к лимонам, грушам и айве на желтом фоне, весенним цветущим деревьям, крабам и сеятелю. Dear friends, as I already announced, my latest paintings are now available in Catch Projecten, Utrecht. I am very pleased to work with the owner of Catch, Roel van Den Brink. His team encourages and provides me with useful tips everytime I visit their shop. Catch Projecten is not only known for paintings of contemporary artists of different styles and mediums, but also for thousands of different postcards, a variety of posters and a framing service which I find has a reasonable price and very professional. Since this year I am creating serious of oil paintings of University cities of The Netherlands, including Utrecht, Amsterdam, Nijmegen, Groningen, Maastricht, Rotterdam, Delft, Leiden, Eindhoven, Enschede, Wageningen. The first three are done, seven more to go! Sometimes you may see my paintings at the window when you pass by the shop, or, if you visit, you may check the reproductions of my paintings, nicely printed and framed with an acid-free passepartout (the price is lower than for the oil painting). Tour de France starts in Utrecht! Oil on canvas, 40×50 cm, May 2015. Sold. Nijmegen. 40×50 cm, oil on canvas, April 2015. Niuwegracht, Utrecht. Edition 2. Oil on canvas, 40×50 cm, April 2015. Sold. Thanks for the nice stories you tell me about the city. Now i know that the city wall was built in 14th century and it was twice bigger than now, that there is still an old tradition to ring the tower bells to notify farmers that gates close at 22:00. And old gentleman told me that there was a row of a little old houses in front of a windmill, that were remained in the 2nd World war, but were too old to survive to nowadays. I have depicted some birds on the painting: a hunting heron and ugly ducks sleeping under a bush. If you look closer, there is a woman, the owner of a house by the windmill, she stands in her garden in a blue jeans skirt and checks if i paint her house good enough. By the way, thanks to the nice couple and a lady, history teacher. Didn’t asks your names, shame. It was nice to talk to you, guys. PS. Oil on cotton canvas, 40×60 cm. Have you seen three horses? Fields around Utrecht. 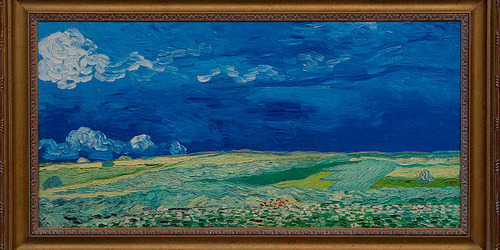 30×40 cm. Oil on canvas. Sold. There were even more, but they always moved and only three of them are going to stay in the history! Quick sketch of field by Utrecht. Over-burned my hands, it was sunny and hot, but it worth it! Petite lovely painting with a windmill at the horizon. 30×40 cm, oil on canvas. June 2014. Plompotorengracht, Utrecht. 65×90 cm. Oil on canvas, 2014. Sold. Pleinair in June, 2014. Oil painting of yet another huge size 65×90 cm. Weather-beatened my hands, trying to hold my canvas against wind blowing me away. — в Utrecht. This view is just around the corner or our house. I remember when I was painting it, a man came out of a house nearby and invited me to see some paintings in his apartment. He and his wife were moving that day to another town and after just a five minute talk they invited me to their new place to stay over a night and maybe to paint in that area. Dutch people never stop to impressed me by their hospitality. Still life of flowers in a vase. Rainy cloudy day drived me into painting these tiny field flowers with an iris and gerbera sticking out (extracted from a bunch of flowers). Took me about 2 hours to paint this beauty. 50×60, oil on canvas. June 2014. Две новости из мира искусства про Ван Гога и Бэнкси. Точную копию картины Ван Гога, выполненную с помощью 3Д принтера, можно купить за 25000 евро. Как сообщает Reuters, заказать точную копию одной из пяти работ, в том числе “Подсолнухи” и “Урожай”, можно в Амстердамском музее Ван Гога. Картины производятся компанией Fujifilm, которая воссоздает малейшие неровности и штрихи кисти, точь-в-точь как на оригинальном полотне. Метод позволяет печатать до 3-х работ в копий, а вырученные деньги музей потратит на реставрацию и исследования. Старые добрые китайские подделки канули в лету. Oil on canvas, 65 x 90 cm. April 2014. Dear neighbours of Lange Nieuwstraat, you are nice and friendly! It was a pleasure meeting you all. This painting of Utrecht is a part of upcoming series ‘The Netherlands are more than Amsterdam’.